I lived in the guesthouse of my friend Jerry Schneider up on Rising Glen Road in the Hollywood Hills. My friends and I threw parties up there on a regular basis. We had all the ingredients of making a great party. A beautiful modern home with a pool and view. Beautiful girls and some minor celebrities. You knew that your party was a hit if there were party crashers in attendance. These two guys Eddie and Gene were at every hot Hollywood bash. I could never figure out how they got into everything; but if they weren't there, it was probably a dud party. 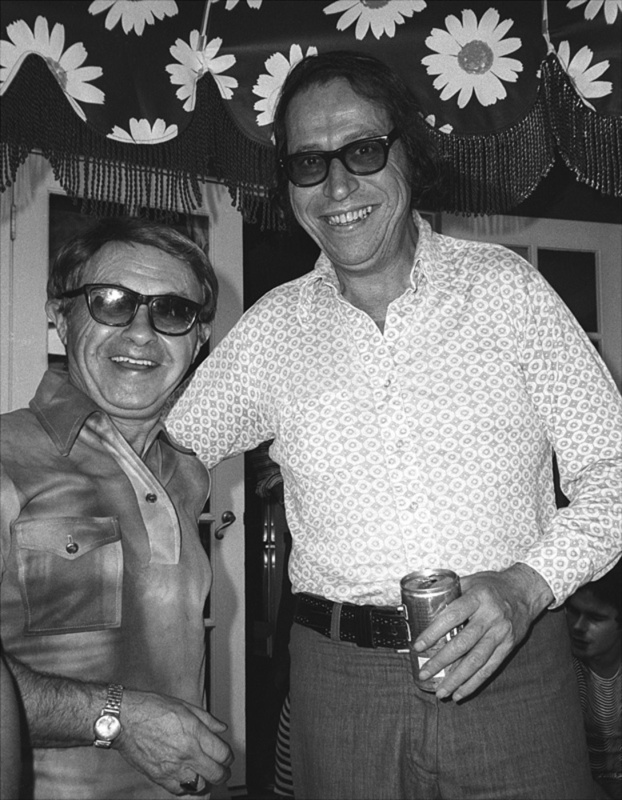 Gene was really short and everyone referred to the duo as "Eddie And The Midget.” Legend has it that Gene worked for the Gas Company as a meter reader by day and by night, he turned into this dashing party crasher. He was a fantastic dancer and would always hook up immediately with the most beautiful girl and proceed to spin her around the dance floor. You never saw anything like it. We never invited them to our parties, but we never threw them out either. What I like about this photo is that you can see they were so delighted to be the subject of my camera. Diane Arbus would have loved to photograph Eddie and Gene. I miss them very much.